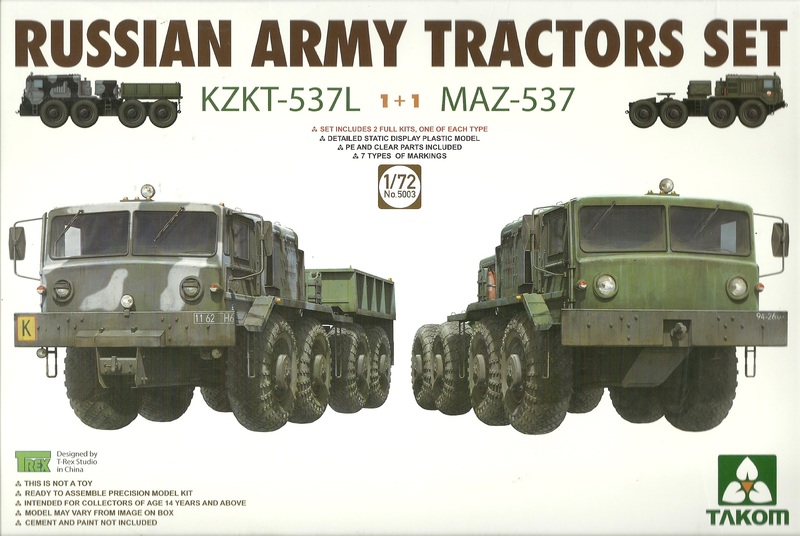 Contains parts to build both the Russian Army KZKT-537L and MAZ-537 heavy tractors. The KZKT-537L is an airfield tractor primarily used for towing heavy aircraft such as the AN-22. It can travel at 20kph on concrete and 5kph offroad. The MAZ-537 is a heavy tractor designed for loads of up to 50 tons using trailers such as the ChMZAP-9990 or ChMZAP-5247G. Later versions can move 65 tons. It has been used as an artillery tractor for towing rocket or ballistic missile launchers & tank transporter.